NCGS Commemorates the 1906 Great Earthquake by Walking…the Hayward Fault! On April 15, 2006, Drs. 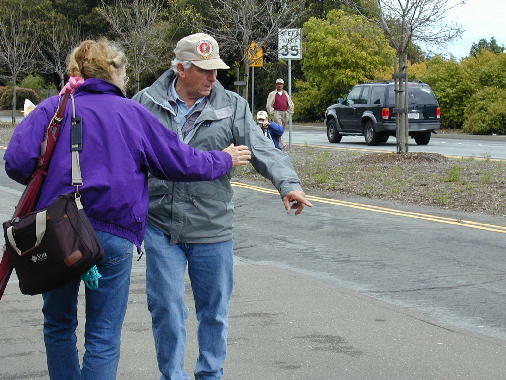 Joyce Blueford and Mitch Craig lead NCGS members, family, and the general public on a field trip to examine evidence of the Hayward Fault in the East Bay. The trip, as with all NCGS 1906 Centennial events was listed on the centennial website, along this reporter to discover it. 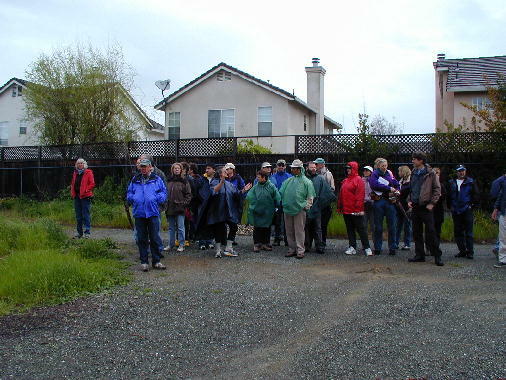 The group attending the Tracing the Hayward Fault – A Potential Disaster Area field trip, met near the Fremont BART station, which amazingly is almost on the Hayward Fault, in order to follow the fault trace from Fremont to Oakland. 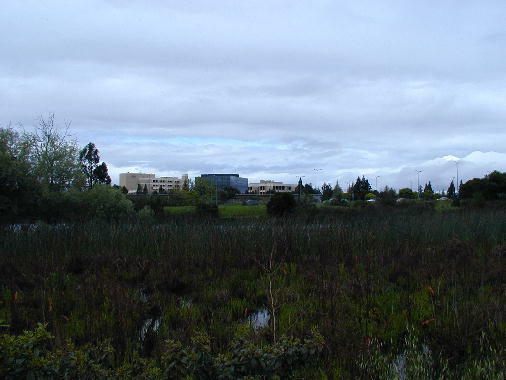 The group met at the Math/Science Nucleus, an educational center and community service of the Alameda County Flood Control and Water Conservation District, which is located at Tyson’s Pond, and is actually a sag pond. The Math/Science Nucleus provides educational opportunities for students from sixth grade through college in botany, zoology, geology, hydrogeology, paleogeology, anthropology, habitat restoration and plant propagation. As they say in bad novels, it was a dark and stormy day. 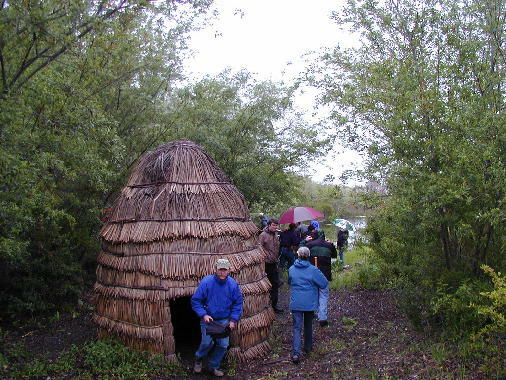 So while attendees stayed warm and dry inside, munching coffeecake and grapes, the group was told about the fault at the site and the significance of the sag pond by Dr. Joyce Blueford, executive director for the center. Occasionally listeners glanced outside to eye the downpour. After the presentation Joyce invited the group to investigate the water treatment ponds. Luckily the rains had slowed to a mist and the group walked around the ponds, learning about the plants used to treat surface run-off by taking up heavy metals. From an engineering point of view, the ponds are not well built. 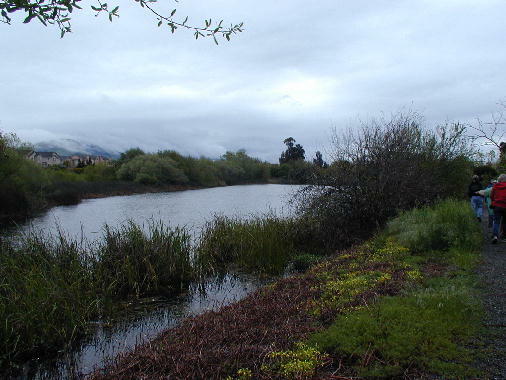 Water is supposed to flow from pond A to B to C and then to the sag pond formed by the fault. Unfortunately, because of the crush zone caused by fault movement, the water in the treatment ponds enters the first groundwater zone and water from the sag pond flows back into the treatment ponds. In the end the water does get treated before entering the Bay, but not in the manner originally intended. 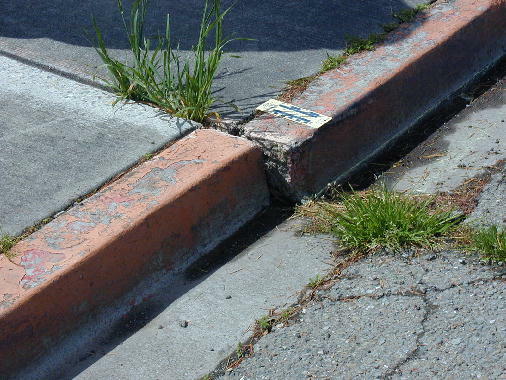 Crossing Walnut Street and heading south Joyce showed evidence of the active fault – a raised shelf adjacent to the BART parking lot. The north end of the parking lot is where the two traces rejoin each other to continue north to Hayward. 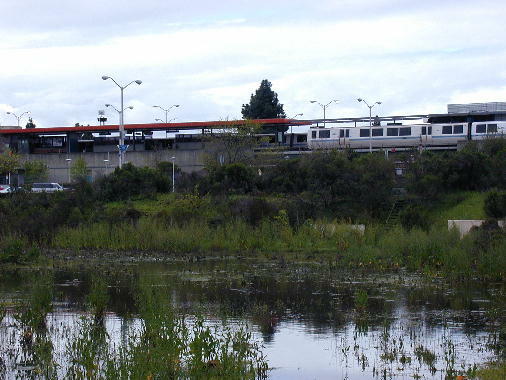 There is a proposal to extend BART south to San Jose; however, it would cross the fault twice on its way south and this may prove problematic from a safety and engineering perspective. The fault does not creep in Fremont which could result in a sudden jolt as pressure is released. A meandering path through an undeveloped area followed the fault zone south. New housing developments have been recently developed on either side of this path-park, oblivious to the fault while still staying off the active trace. 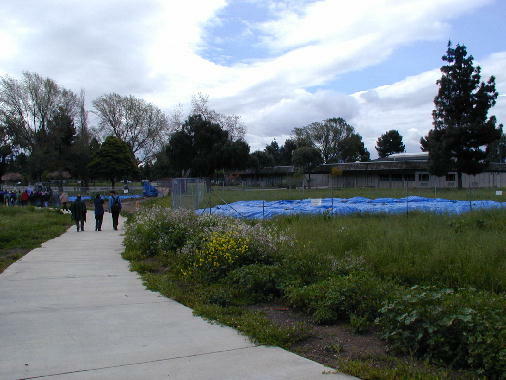 The path leads to the old site of the Fremont Library. Now a hillock in a park; careful observation shows it to be a scarp. So, in fact, Fremont built its library on the fault! 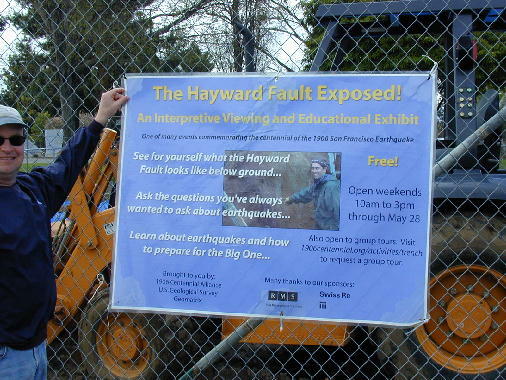 Also in the park is an exhibit “The Hayward Fault Exposed!” an interpretive viewing and educational exhibit sponsored by the U.S. Geological Survey, City of Fremont, Risk Management Solutions, and Swiss Reinsurance. 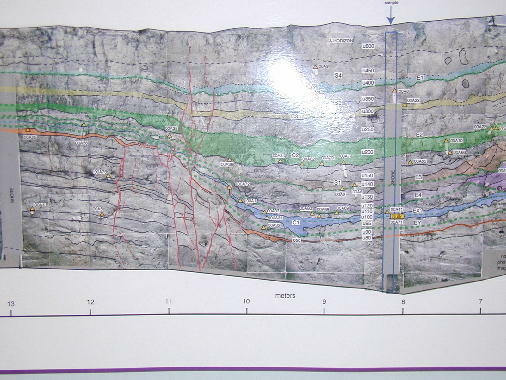 The Exhibit features a 14-foot-deep view of the Hayward fault. The fault is easy to see at this location and visitors are encouraged to descend a staircase to meet the Hayward fault face-to-face. At the time of the field trip, the exhibit was full of water and closed; but is now open until May 28th. 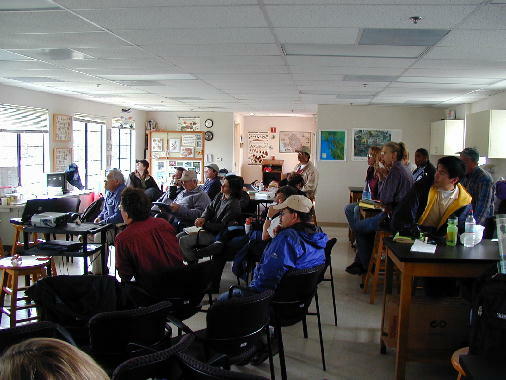 Returning to the Ecology Center at Tyson’s Pond for lunch, everyone refreshed and regrouped and set off for Hayward and more evidence of the fault, under the guidance of Dr. Mitch Craig of California State University, East Bay (AKA Hayward). There were several stops on the way to view evidence of creep, including a stop at Spring Drive Park, a steep scarp that has blocked groundwater flow, forcing it to the surface. 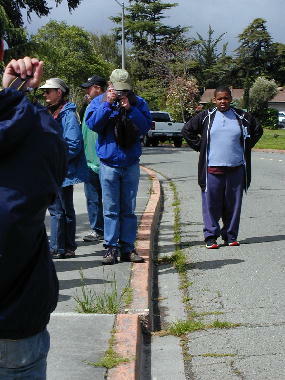 At Hayward Memorial Park right-lateral offset is deforming the tennis court walls, curbs and path walls. In Hayward the dramatic highlight was Old City Hall. The actively creeping trace passes underneath the front portion of the building. The outside shows very little rupture, while large cracks are visible in the walls inside and the floor has a noticeable droop. Next door at the Veterans Memorial a subsidiary trace was very evident as a slope break in the driveway. 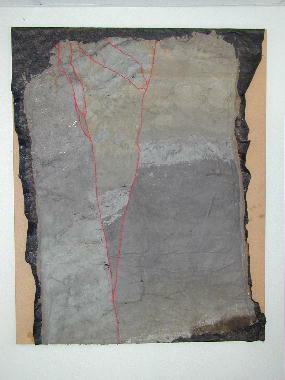 Walking from A Street to D Street, the group viewed cracked walls and en echelon cracks in the ground. It was clear Hayward is being pulled apart by ground movement, yet no one seemed eager to move downtown out of harm’s way. Many of the buildings were visibly bowed by the right-lateral deflection. Then the group drove to Montclair. Just after Highway 13 branches off from Highway 580 the highway crosses the fault, placing it to the east. The fault zone is very close to Highway 13 nearly to Highway 24, when the highway crosses the fault zone again. Arriving in Montclair the evidence wasn’t immediately apparent, in part because the buildings are well maintained. People stopped to ask why such a large group was wandering up and down the streets of “downtown”. When it was explained that Montclair lies right over the fault, no one seemed concerned! 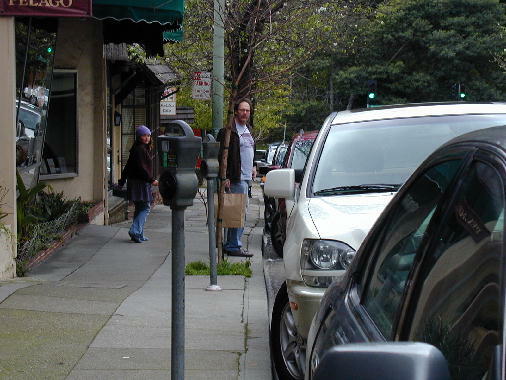 Evidence of creep was observed in the shop walls along Mountain Boulevard and streets parallel to it. The walls of the shops had been repaired as mentioned, but the sidewalks betrayed the secret. They were torn, crumbling, and bowed by the forces below. Visiting the tennis courts just north of downtown showed more evidence of right lateral movement. To the north the fault follows the Berkeley hills and is harder to find, excluding Memorial Stadium, of course, so the trip ended in Oakland. It was a thoroughly enjoyable day for exploring the Hayward fault, a day that started out drizzly and threatening, turned warm if not sunny. The NCGS would like to thank Drs. Joyce Blueford and Mitch Craig for taking the time to lead a very interesting field trip. The NCGS also would like to thank Phil Garbutt also from California State University, East Bay (and NCGS Scholarship Chair) for also speaking and making copies of the two symposia on the Hayward fault for available purchase during the field trip. And of course, the NCGS must once again thank Tridib Guha for coordinating the field trip, and providing a delicious lunch. And finally I must personally thank Clyde Warhaftig for originally sparking my interest in geology.